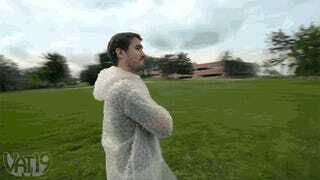 What Harm Could Possibly Befall Someone Wearing a Bubble Wrap Suit? If bubble wrap is good enough to protect that ceramic frog you bought on eBay as it's shipped from Taiwan, surely a suit made from the same material would give mere mortals invincibility, right? At the least, Vat19's $15 blazer and pants set made from bubble wrap would provide a decent buffer from the other commuters banging against you on a crowded subway train.